Truth is, I barely knew anything about this country either. But having been to many “popular” destinations in the past, I was thirsty to explore somewhere less-known; somewhere relatively untouched. 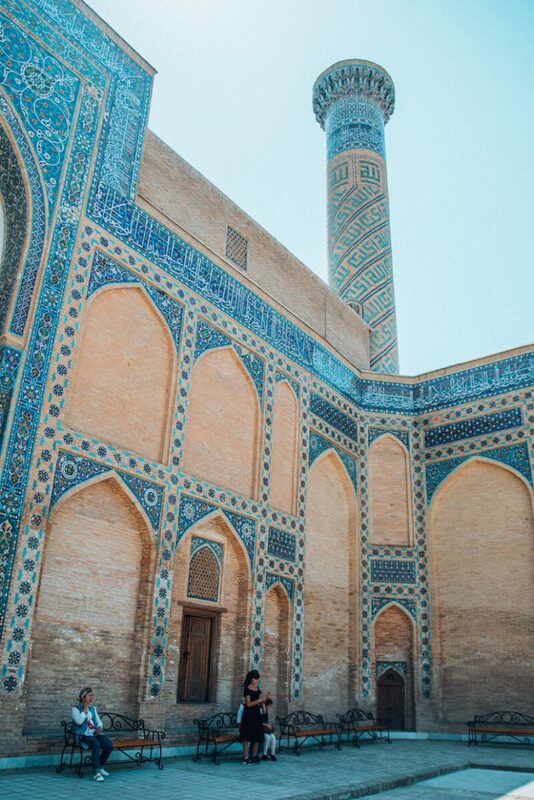 As it turns out, Uzbekistan is actually not as hidden as I had thought — there were quite a lot of tourists — but it’s still one of the most underrated and breathtaking places I’ve ever visited. So here’s a guide on what to do there and what to expect. I hope it will convince you to pay a visit too! 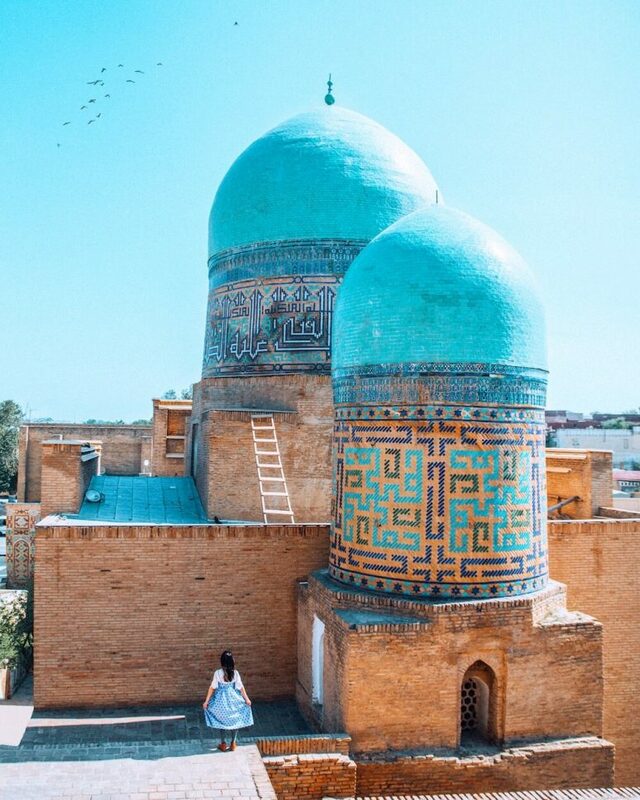 If you don’t have time to travel the entire length of the Silk Road, Uzbekistan is the perfect week-long glimpse into it. Located in the center of Eurasia, it played a key role back in the days not only in the trade of gold, silk, and spices, but also of culture and religion. 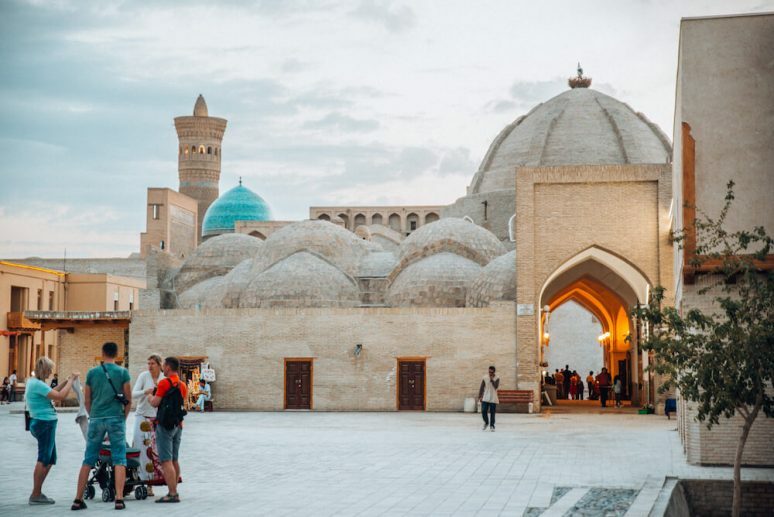 Missionaries, scholars, and musicians who passed by the Silk Road hubs of Samarkand, Bukhara, and Khiva brought Islamic art and teachings along with them. 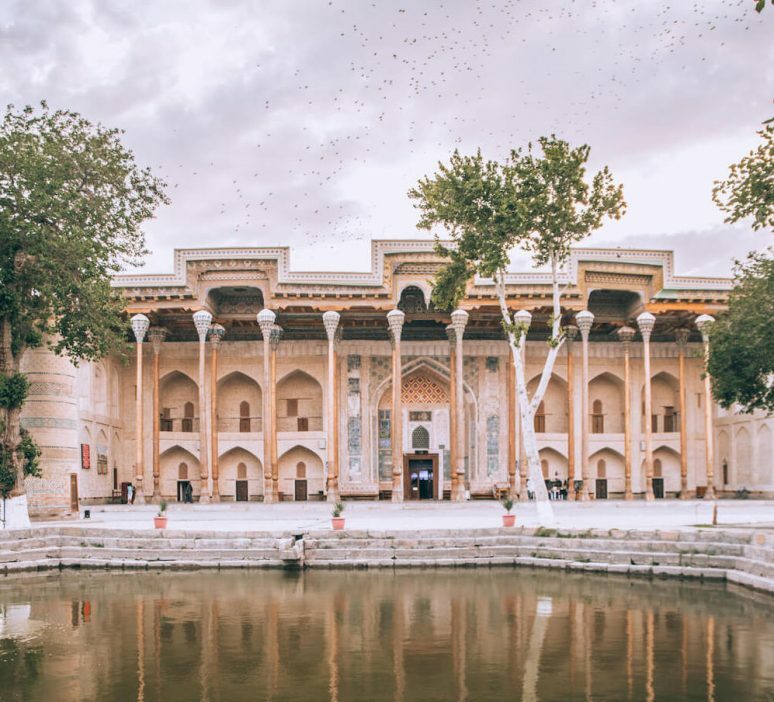 Today, you’ll see these three key cities bustling with beautifully ornate madrasas, mosques, and minarets — scenes you’d only expect to see inside a chapter of One Thousand And One Nights. Uzbekistan is one of only two double-landlocked countries in the world (the other one being Liechtenstein. This means that not only is it landlocked, but it’s also surrounded by other landlocked countries. So the most common ways of getting to Uzbekistan are by air or by car. Flying is the easiest way to reach Uzbekistan. The main international airport is in Tashkent (TAS), but there’s also one in Samarkand (SKD), which is where my partner and I flew into. Aeroflot and Turkish Airlines are the two main airlines that operate flights to Uzbekistan. You would therefore either have a layover in Moscow or in Istanbul somewhere on your journey. My partner and I took the Aeroflot route from London. The flight was around four hours to Moscow and another four hours from Moscow to Samarkand. It is definitely possible to do a roadtrip around Central Asia, covering Kazakhstan, Kyrgyzstan, and Tajikistan as well. Taxis and buses are also available to help you cross the borders into Uzbekistan. There are three main border crossings between Kazakhstan and Uzbekistan in the cities of Gisht Kuprik, Chinaz, and Kungrad. From Kyrgyzstan, the main border crossings are at Gisht Kuprik, Khanabad, and Andijan. In Tajikistan, Dushanbe (its capital) is about 55 km from the border of Uzbekistan in Denau. Some borders do have opening hours. For example, if you’re planning to enter through Gisht Kuprik, be sure to do so between 7am–9pm (Tashkent time). If you’re a citizen of the European Union or other select countries such as the USA, Canada, India, and Australia (there are many more too), you’re eligible for an e-visa. This means you simply have to fill out a standard online application (without needing a letter of invitation), and you’ll receive your visa via e-mail within two working days. You can find more information about the e-visas here, including whether you’re eligible for it. If you’re not eligible for e-visas, you will need a letter of invitation, which isn’t as hard to obtain as it may sound. There are many travel agencies that can do that for you, online. The one my partner used is Global Connect and it cost around $65. He then applied for his visa in person through the embassy, and received it within one week. We found the visa procedure to be fairly simple overall and did not encounter any issues at all. While it’s feasible to cover the main attractions of Uzbekistan in one week, my partner and I found that spending 10 days in this country was ideal. This gave us the perfect amount of time to really absorb everything and relax while sightseeing. Below are the main cities to visit, along with their must-see spots. 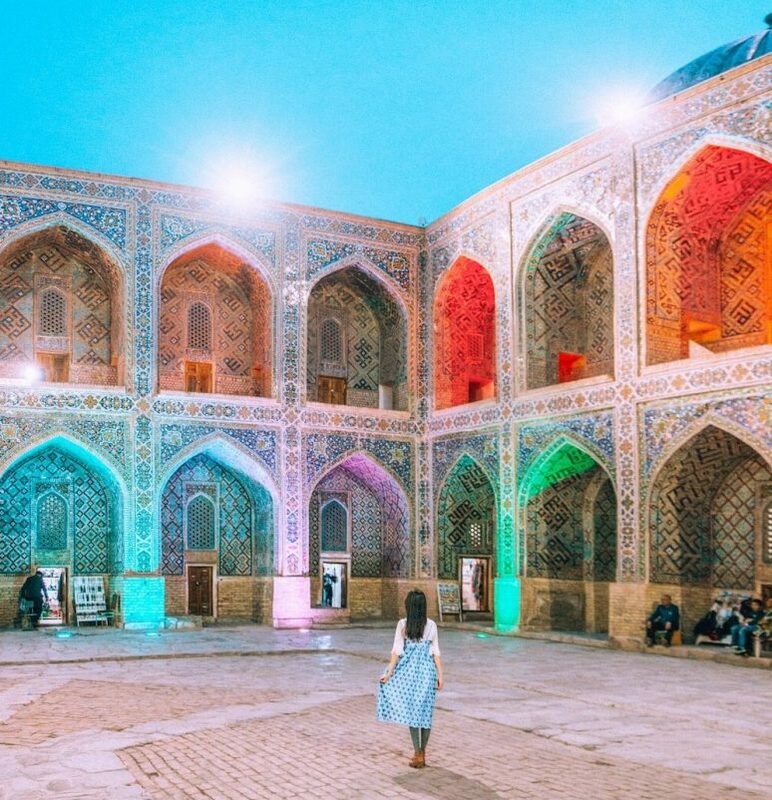 Registan – the pearl of the city; a square with three of the world’s oldest madrasas, worth visiting both at day and at night. Gur-e-Amir – this stunning piece of architecture was the model for the Taj Mahal. Shah-i-Zinda – an avenue of mausoleums that showcase some of the richest tile work in the Muslim world. 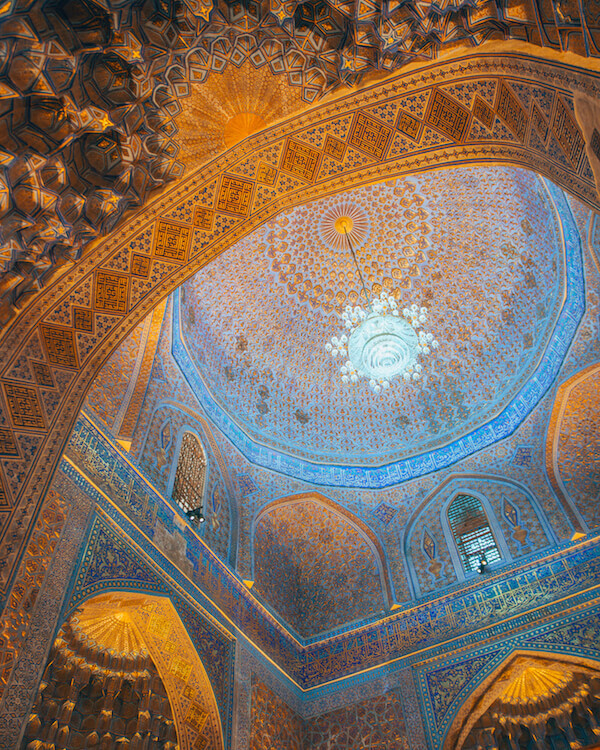 Bibi-Khanym Mosque – the jewel of the Timurid Empire, this was once one of the biggest mosques in the Islamic world. The Siob Bazaar – the city’s vibrant main market is a great place to get a taste of local food and treats – be sure to try halva (a sweet that resembles fudge). Ulugh Beg Observatory – it showcases some of the world’s most advanced astronomical studies led by a Timurid ruler. Note: The above places are all within walking distance of each other, aside from Ulugh Beg Observatory, which may require a taxi. In addition, if you have an extra day in Samarkand, a day trip to Shakhrisabz, one of Central Asia’s most ancient cities, is very much recommended. Tip: When you visit Registan, make sure to watch a traditional Uzbek concert inside the Sher-Dor Madrasah. 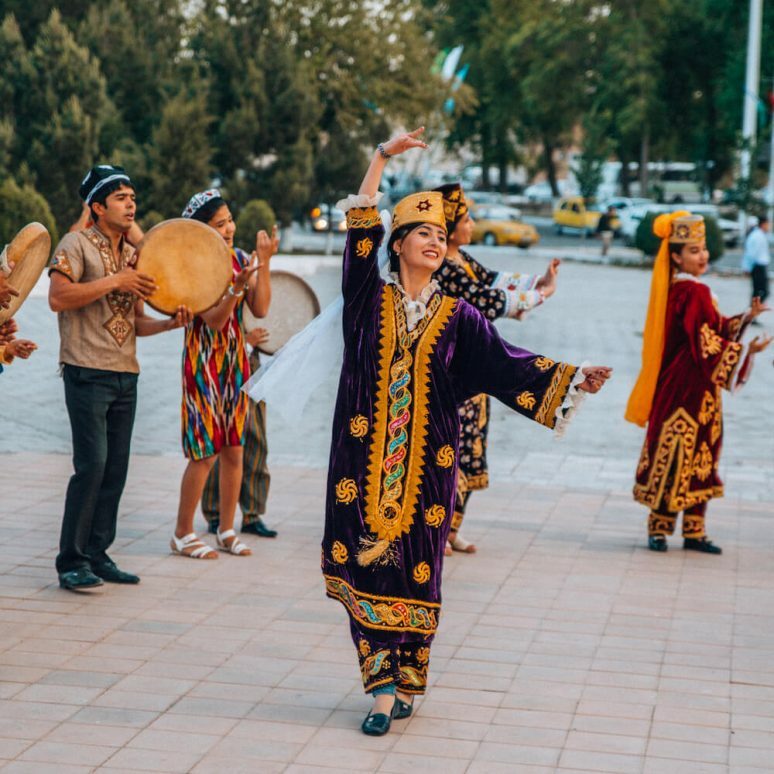 Against the backdrop of the gorgeous madrasah walls, you’ll see locals perform in their traditional clothing, showcasing not only their music but also their culture, such as scenes from a Uzbek wedding. The concert starts at 7pm daily, and it’s $5 per person. You can buy tickets right inside the square even right before the concert starts. 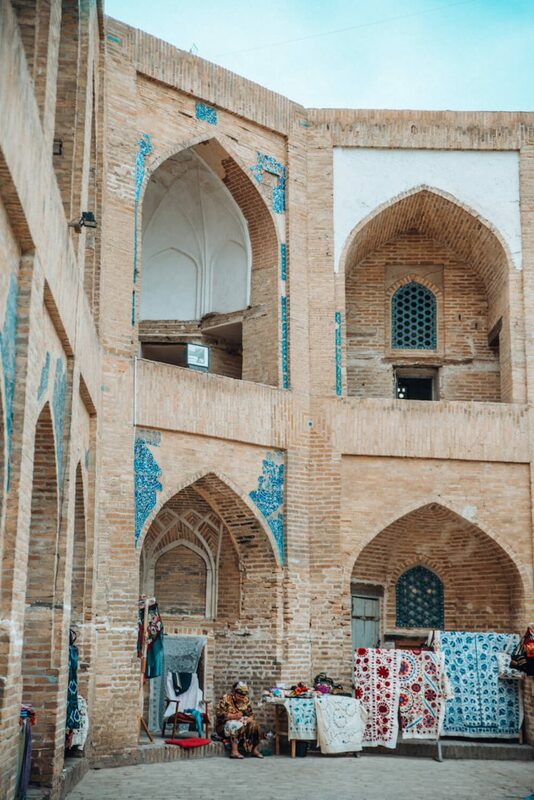 The city of Bukhara is more than 2,000 years old. Its historic center has been preserved very well for the last two centuries. It therefore gives a great glimpse into a medieval Central Asian Muslim city filled with ancient religious architecture. 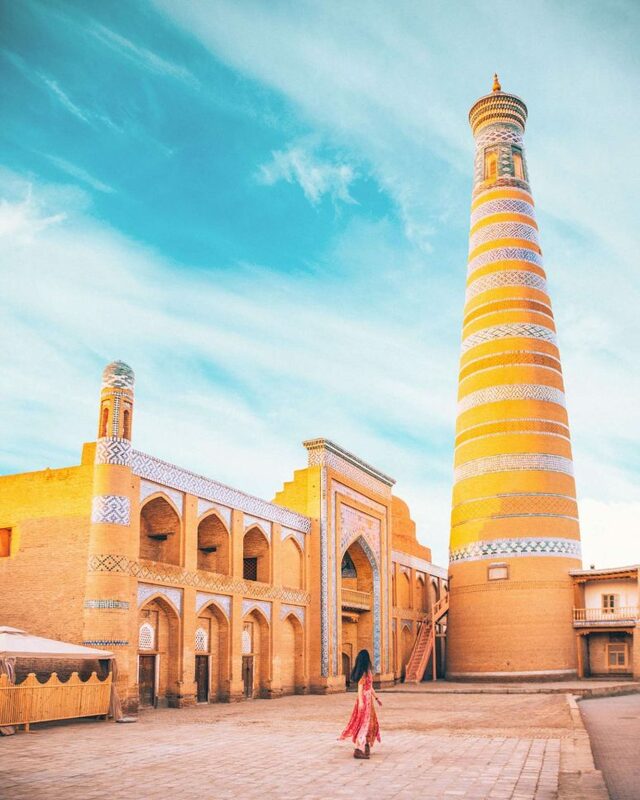 Kalon Minaret – Genghis Khan was so impressed by this tower that back in the 13th century, that he ordered it to be spared while his troops destroyed the rest of the city. Kalon Mosque – this mosque, with a spectacular courtyard, is right next to Kalon Minaret. Ark Fortress – Bukhara’s oldest structure was the residence of its emirs for centuries . Chor Minor – the gatehouse of a long-gone madrasah built in 1807, it has four minarets that each represent a different religion. Abdulaziz-Khan Madrasah – built in 1652, its intricate, colorful tiles are truly impressive. Bolo Hauz Mosque – known as the 40 Pillar Mosque, its ceiling is held by 20 wooden pillars that reflect elegantly in the pond in front of it. Lyabi-Hauz Complex – a peaceful yet lively 17th century trading square with music playing in the evenings, and a pond with restaurants around it. Taki-Telpak Furushon – a colorful domed bazaar with lots of interesting souvenir shops. Tip: To get a taste of the “real Bukhara,” make sure to book a slot at a Hammam, a traditional steam bath. The Bozori Kord Hammam is one of the oldest in the world (built in the 14th century) and a great way to experience this exotic ancient ritual. Not only would you be discovering the secrets of the Oriental Massage, but you’ll also get a sense of the real way of life in Bukhara. 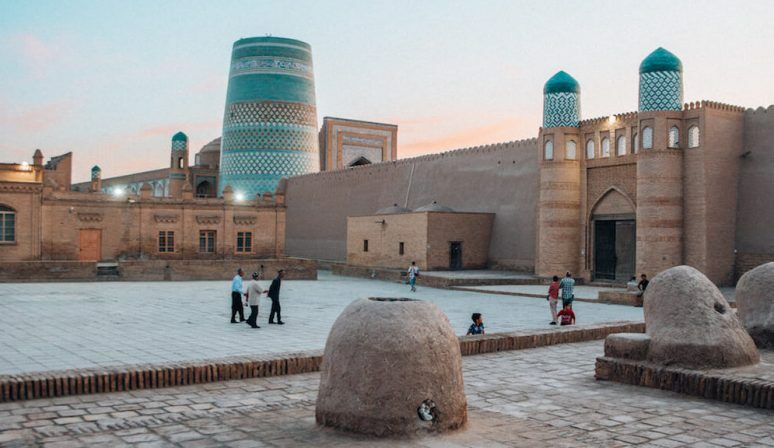 Out of all the Silk Road gems in Central Asia, the city of Khiva is perhaps the most intact, remote, and preserved of them all. This medieval town is essentially an open air museum. It has a fortress surrounding its inner city, which is home to dozens of ancient madrasas, mosques, minarets, and clay-colored houses. Itchan Kala – the inner town of Khiva, in which most of the city’s attractions reside. It gets crowded with tourists during the day, but walking around at dawn or dusk makes for a very peaceful and unique experience. Tash Hauli – a palace inside the Itchan Kala with extravagant interior decorations, blue ceramic tiles, more than 150 rooms, and 9 courtyards. Juma Mosque – this unique mosque has 218 wooden columns supporting its roof. 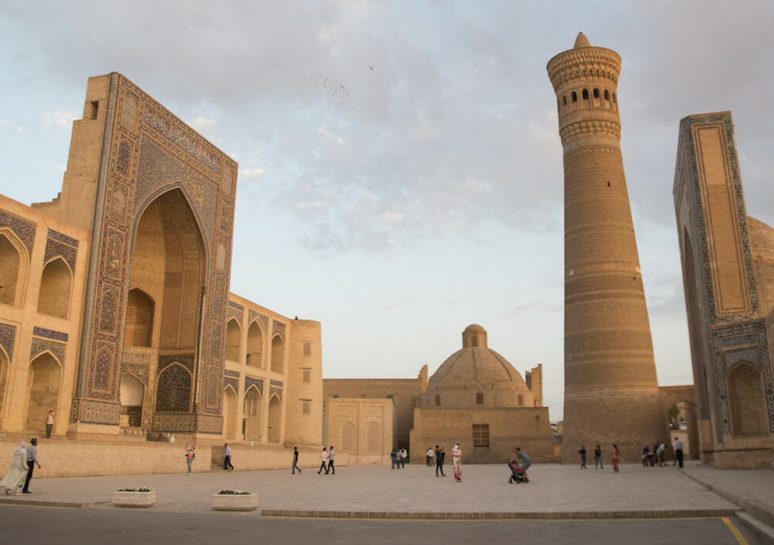 Kuhna Ark – a fortress that used to be the residence of Khiva’s rulers. Watchtower – accessible through the Kuhna Ark, this is a really good spot to watch sunset with a gorgeous view of the city. Isfandiyar Palace – a 10-minute walk outside the west gate, it’s home to gold-embroidered ceilings and lavish chandeliers. Kalta Minor Minaret – a turquoise-tiled minaret begun in 1851 by Mohammed Amin Khan, who aspired for it to be 80m tall. Unfortunately, he dropped dead in 1855, leaving the structure unfinished at 29m, but still looking mesmerizing. Islom Hoja Minaret – standing 57m tall, it has the resemblance of a lighthouse, and you can climb it for fine views over the city. 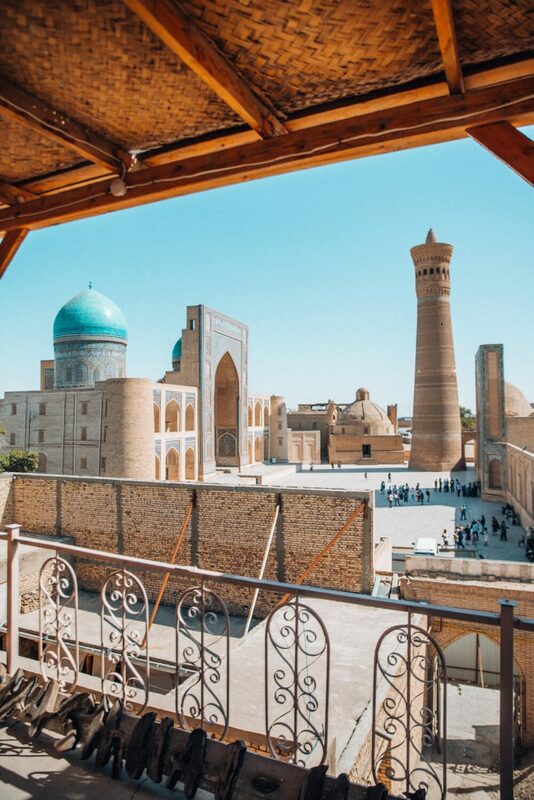 Tip #1: Do not miss out on Khiva. 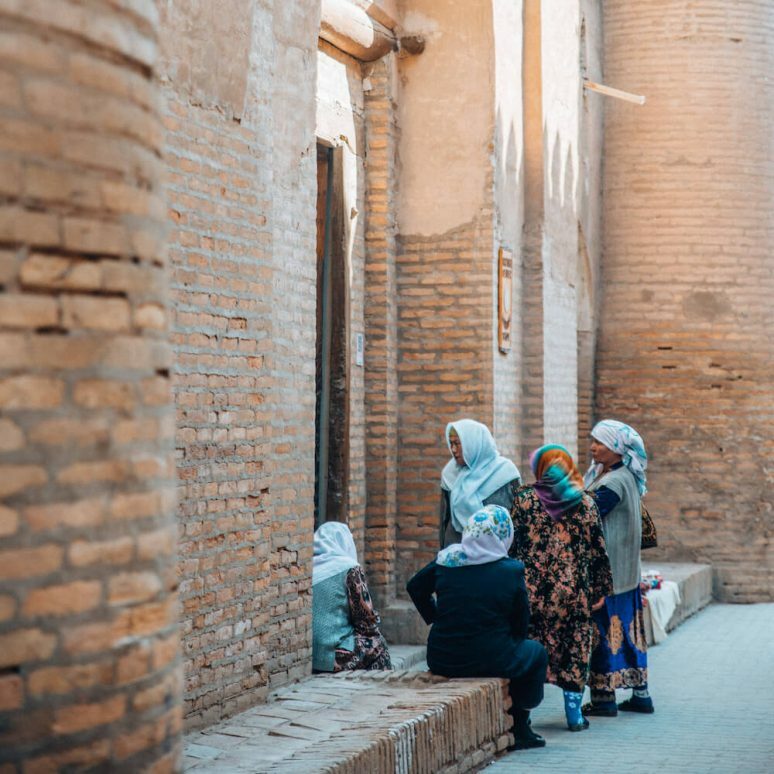 Due to its remoteness and small size, Khiva is often overlooked and people tend to skip it if their schedule is tight. If your time in Uzbekistan is limited, cut your visit in Bukhara or Tashkent shorter by a day so that you’d have time to see Khiva. Because of how well it’s been preserved, this city truly stands out with its ancient and authentic vibe. Being there felt like walking inside a film set. The clay-colored architecture makes this town resemble a real life sand castle city — something truly unique and hard to find anywhere else in the world. Tip #2: Get a personal guide inside Itchan Kala. 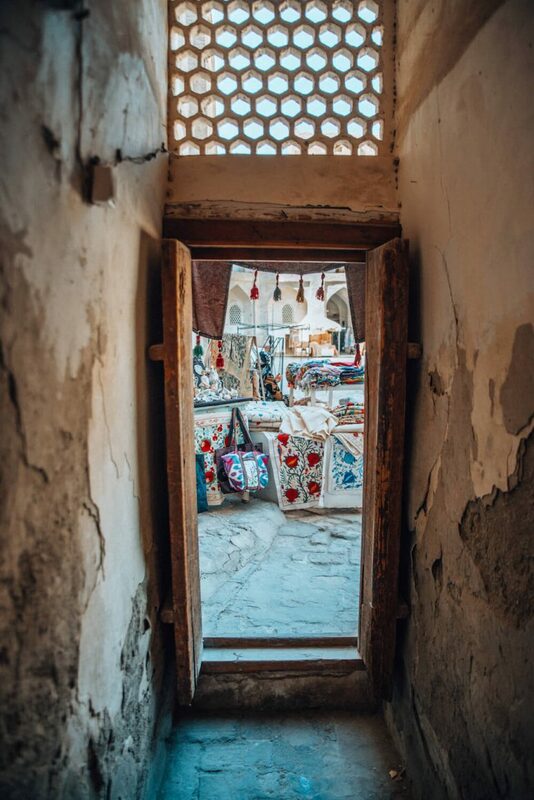 There are many places in Khiva that are quite hard to find on your own. Lavish, colorful courtyards tend to be hidden behind small doors you’d never think to walk through because, from the outside, they don’t appear to lead to anywhere special. Getting a guide costs around $30 for a 3 hour tour (you pay a total of $30 even if you’re traveling in pairs), and you can request this service inside the ticket office right at the entrance of Itchan Kala. Being the capital of Uzbekistan with the largest international airport in the country, you are most likely to fly into and out of Tashkent. 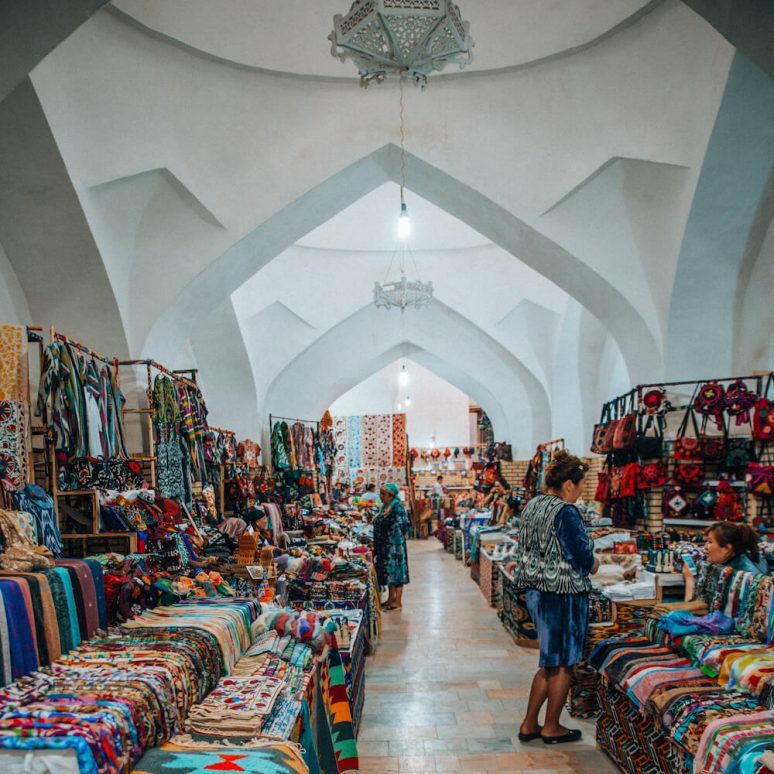 Wandering around the city, you’ll find part of it cluttered with modern buildings; another part adorned with Soviet-style architecture, and yet another part that’s more traditionally Uzbek with mud-walled houses, crowded bazaars, and traditionally clad farmers hard at work. The metro stations – if you’ve seen or heard about the very artistic and well-decorated metro stations in Moscow, you’ll find something very similar in Tashkent. The metro stations there were built in the former USSR and are among the most ornate in the world. Minor Mosque – built in 2013, it’s one of the newer monuments of the city and is covered in white marbles. Chorsu Bazaar – being the biggest farmers market in town, it’s the perfect place to find colorful mountains of spices, sweets, souvenirs, and the freshest fruits around. Hazrat Imam Complex – a religious center with a madrasah, mausoleum, and Islamic Institute, where future preachers are taught. 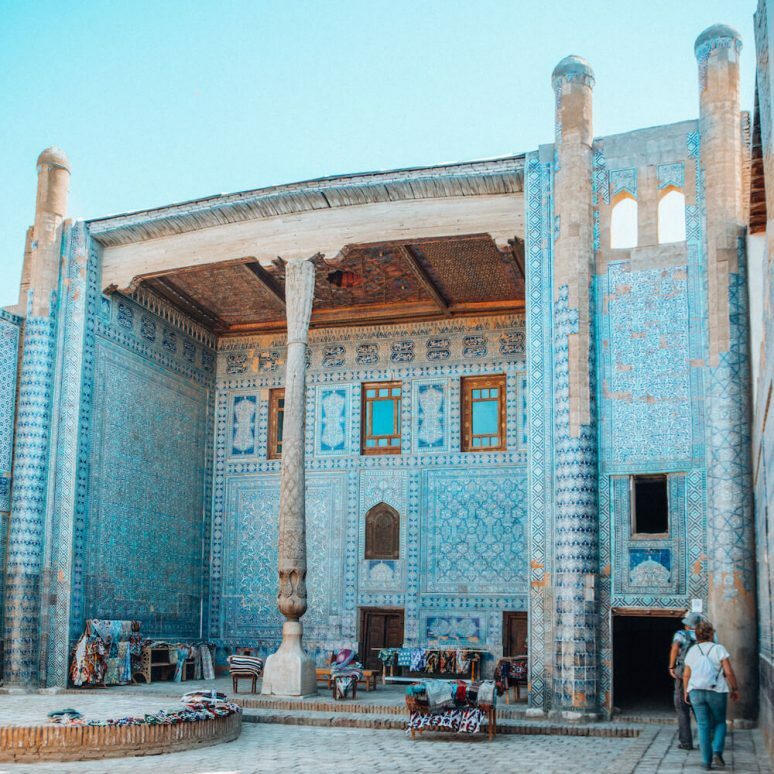 Amir Timur Museum & Square – a museum about the Timurid empire sitting inside a square that also houses the very interesting architecture of Uzbekistan Hotel. It’s very easy to navigate Uzbekistan on your own, and you can do so via trains, flights, or taxis. My partner and I used a mixture of them all. There are multiple daily trains connecting Samarkand, Bukhara, and Tashkent. Many of them are high-speed, meaning a journey between Samarkand and Tashkent or Samarkand and Bukhara would only take 1-2 hours. My partner and I took the Afrosiyob high-speed rail and it was a very comfortable experience. The trains were punctual, clean, and equipped with AC — a lifesaver during the summer months. Tickets cost $7 if you buy them at the train stations and around $25 if you reserve online in advance. Note: There are no websites from which you can directly buy these train tickets. 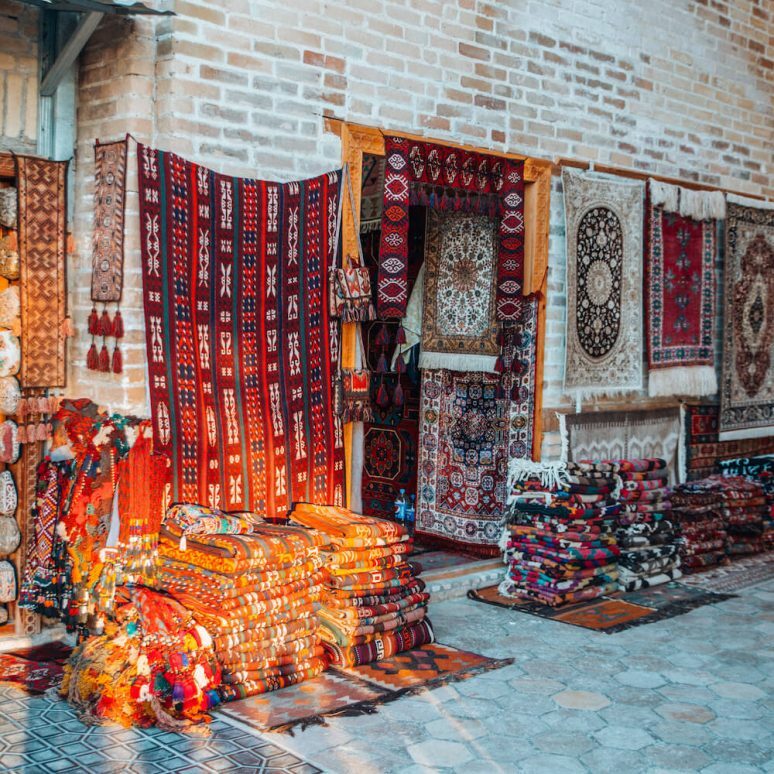 If you’d like to reserve them in advance, the only way is to go through Uzbek travel agencies, which will buy and email them to you. We used Global Connect to reserve ours as it was the most affordable option we found, and it was a smooth and pleasant experience. As I mentioned before though, it is much cheaper and less of a hassle to buy the tickets in person at the station. There are airports in Tashkent, Samarkand, Bukhara, and Urgench (which is about a 30-minute drive from Khiva). Flights between these cities typically range from $25 – $50 one way. Because trains are much more affordable and not that different in their length of journey, it’s almost illogical to fly between Tashkent, Bukhara, and Samarkand. Flying does become a convenient option, however, when going to Khiva. This ancient town is quite remote and a bit harder to reach. A flight from Tashkent to Urgench is the fastest way to get there and it takes about 1.5 hours, costing $50 one way. Taking a taxi between the main cities is not recommended unless you’re going to Khiva. Aside from flying into Urgench, a very common way of reaching this remote town is via a private or shared taxi from Bukhara. The journey is around 7 hours (with breaks in between) and costs $50 for a private ride and $20 for a shared ride. 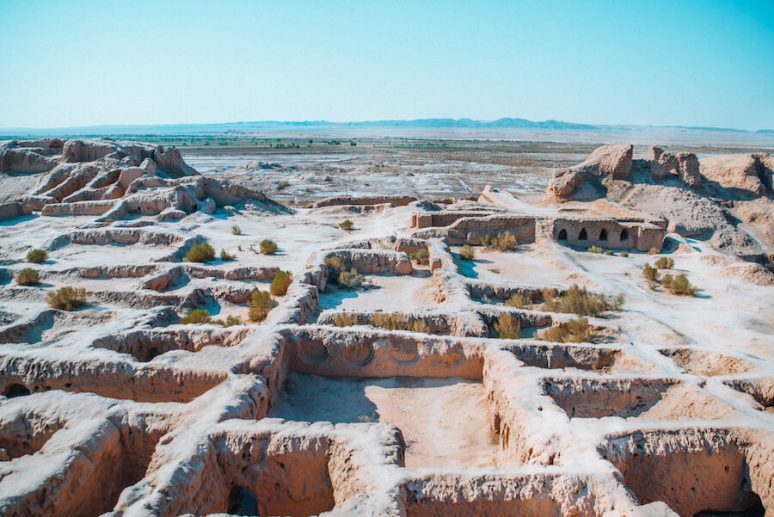 An advantage of choosing to go to Khiva by car (rather than by air) is that you can take a little detour along the road trip to visit some ancient fortresses, such as the one in Tuprakkala. It will prolong your trip by two hours and cost an extra $10, but getting to explore exotic ruins in the middle of a desert is not an experience you get everyday. Within cities, taxis are very cheap. They usually cost $1.25 for a 10-15 minute ride. With that said, Samarkand, Bukhara, and Khiva are walkable cities for the most part. So you’d only need taxis when going to the train station/airport, or when visiting a few remote attractions away from the historic centers. 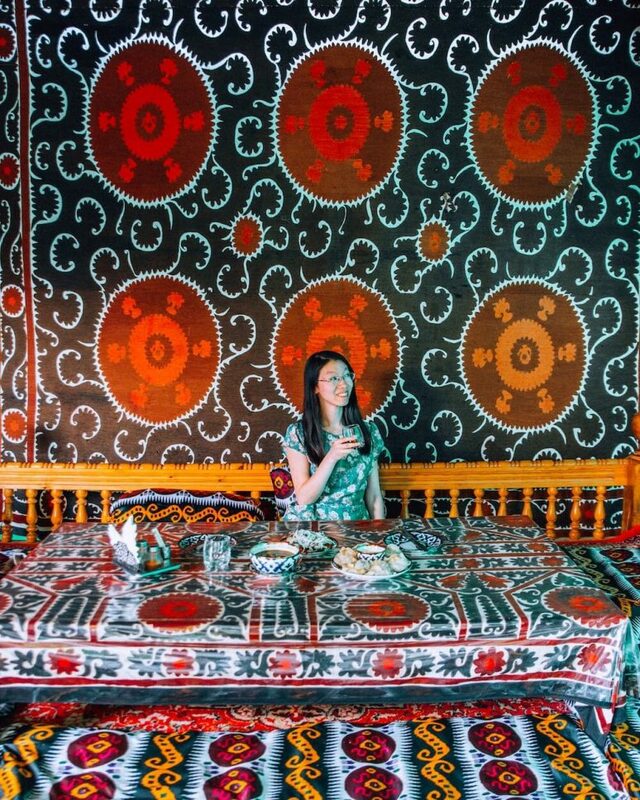 We were completely stunned by how gorgeously decorated, cozy, and homey Uzbek hotels were. They were also very affordable. You can find a variety of high quality boutique hotels, B&Bs, and guesthouses for $20 – $30 a night on sites like Booking.com. The hotels we stayed at were clean, well-situated, and well-renovated. The staff were also very friendly. Just don’t expect good WiFi connection — that’s a rare luxury in Uzbekistan no matter where you stay. Antica B&B – We stayed in this family-run B&B and felt very welcomed. They also have a very stylish courtyard and garden. Jahongir B&B – A family-run B&B with stylishly adorned rooms. K. Komil Bukhara Boutique Hotel – We’ve long heard of how gorgeous and stylish this hotel is, but were unable to stay there due to it being booked out. We did manage to tour this place despite not being guests there, as the hotel staff were super welcoming and happy to show us around. Every room is uniquely adorned with traditional art and it truly looks like a unique place to stay in — just remember to book well in advance as it’s quite popular! Samani Bukhara – We stayed in this cozy hotel with a stylish courtyard, where you can enjoy breakfast on a table bed. Euro-Asia – We stayed in this clean, elegant, and newly renovated hotel and the staff were amazing. The first night we arrived, a reception staff personally took us to a restaurant a little out of the way because everything around us was closed (it was very late). Orient Star Khiva Hotel – If you want to get the unique experience of staying inside a majestic ancient madrasah inside the historic inner town, then this hotel is the one for you. The rooms are all refurbished and said to be comfortable. Tashkent is a big city, so staying close to a metro station makes things a lot more convenient. I’d recommend finding a hotel near the Central Square (close to Amir Temur metro station) as you can meet lots of locals there and enjoy the shopping centers and cafes nearby. 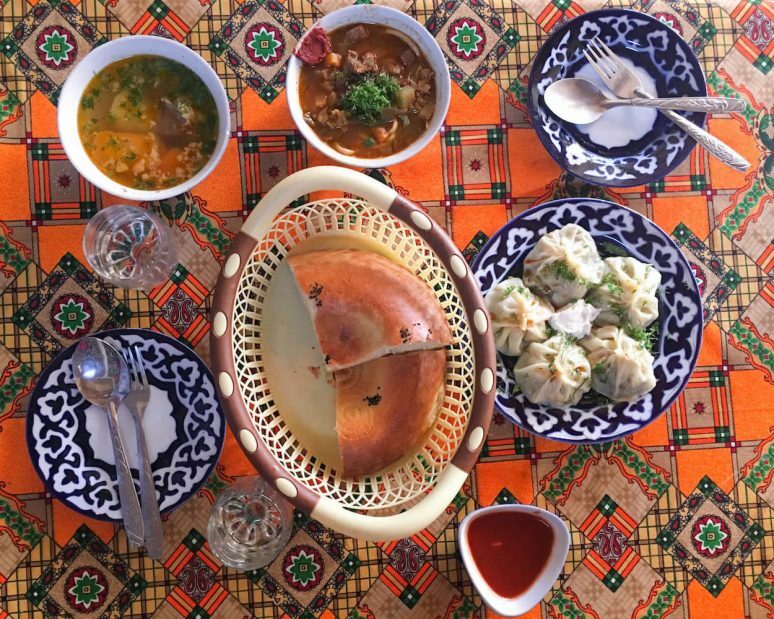 The Uzbek cuisine is one of the most exquisite and flavorful ones I’ve tried, and it’ll leave you longing for more even after leaving the country. 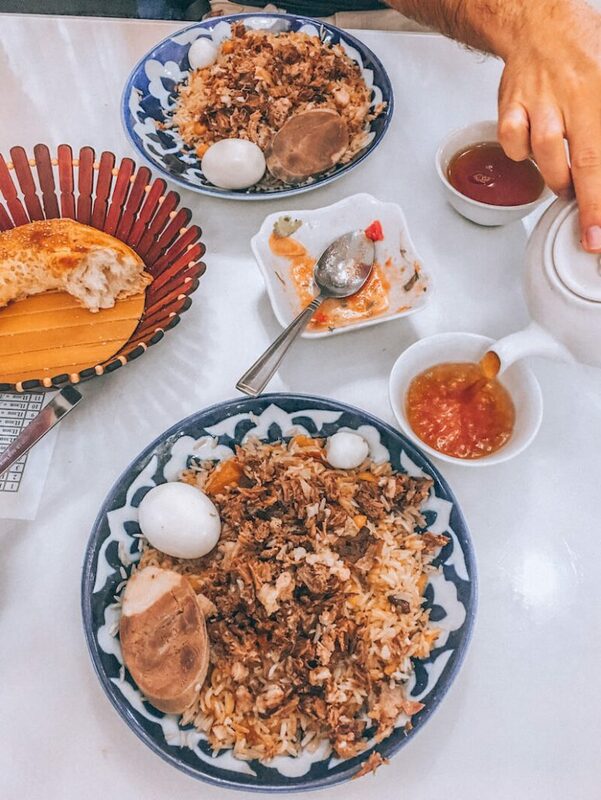 Some must-try national dishes are: plov, shurpa, lagman, manti, somsa, naan bread, shashlik, kazan kabob, and shivit oshi. If you’re a vegan or vegetarian, you unfortunately might have a hard time finding adequate options. This country loves meat to the nth degree, and most if not all of their signature dishes either include or are prepared with it. With that said, there definitely are restaurants that offer vegetarian options, and salads are available almost everywhere. In the list of restaurants further down, I have added an asterisk next to places that offer vegetarian dishes. A tip for vegetarians: say “bez myasa” when ordering salads. It means “without meat”. This can come in handy as some salad plates may also occasionally contain sliced meat (you can see how much Uzbeks love their meat!). Oasis Garden* – An elegant place with friendly staff, great food and fancy decor. 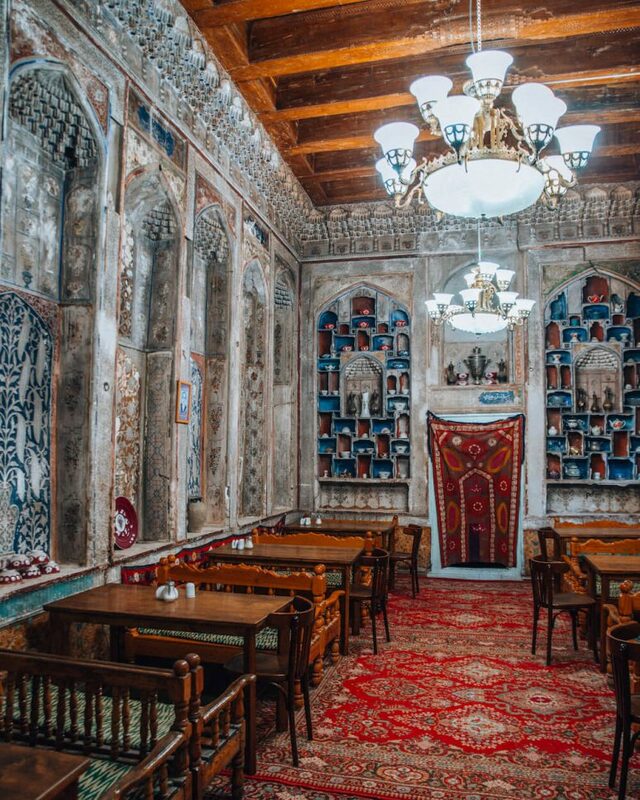 Bibikhanum Teahouse – An excellent place to experience the colourful, cozy, and traditional bed tables, and the decor here is incredible. Samarkand Restaurant – Gorgeous interior, amazing decor and delicious authentic food. Platan* – A nice place to eat outside and the food is delicious. Lyabi House Bukhara – A restaurant by the water with great atmosphere. Temir’s Restaurant – They have some interesting things on their menu — do try out their “mimoza” dish. Doston House* – Amazingly decorated restaurant with friendly service; try out their pumpkin manti. Restaurant Mavrigi – Another stunningly adorned place; definitely try their Uzbek spice tea! Chor Bakhr Restaurant – Very popular amongst locals, this is a must-go! Best tandoor & shashlik we had in Uzbekistan. Minzifa* – Great food paired with an awesome rooftop view. Restaurant Bedruddin – Really good service, food, and live music. Terrace Cafe near Kalyan Square – This spot offers a magnificent view of the Kalon Minaret and Kalon Mosque. It’s a must-go if you want to stop somewhere for a tea or a drink. 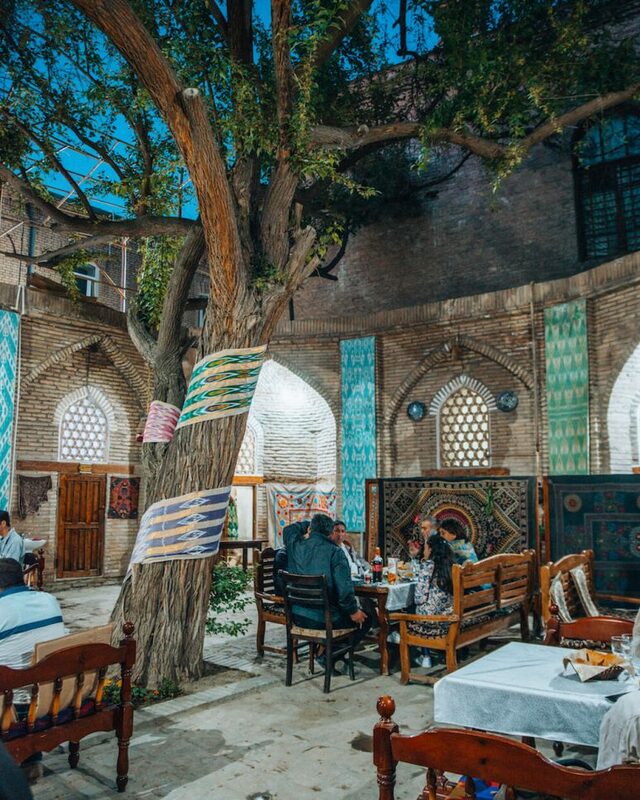 It’s located on top of Old Bukhara Restaurant. Silk Road Tea House – The owners of this place have been making tea and trading spices for 600 years; make sure to try their delicious Spices and Herbs tea as well as their Silk Road Confection sweets! Xojiakbar – About a 10 min walk from Itchan Kala, this local restaurant offers delicious kazan kabob. Terrassa Cafe* – Delicious food paired with an epic view over part of the city; this place is a must-go. Some highlights of their menu include pumpkin manti, shivit oshi, and lamb shashlik. Cafe Mirza Borsh – They have exquisite plov, mastava, tuhum barak, and shivit oshi. Yasavul Boshi* – Some dishes to try here are mix dumplings, shivit oshi, and pakhlava. Plov Center – Hands down the best plov we had in Uzbekistan. The portions are big, the prices are affordable, and it’s very popular amongst locals so it’s a great place to meet people! Caravan* – You can find traditional home decor here with great food and good live music. The revolving restaurant inside Tashkent TV tower – If you want to enjoy a fancy meal overlooking the entire city, pay this place a visit! Afsona Restaurant* – A high-end restaurant with an excellent variety of local food. The best time to visit Uzbekistan is during spring or autumn: end of April to mid-May, or end of September to mid-October tend to offer the most pleasant temperatures (around 14° – 26°C). It doesn’t rain much during those periods either. During these times you can enjoy the heat without it being uncomfortably hot like it is in the summer, when temperatures can go up to 40°C. In the winter, temperatures can go as low as -10°C. Contrary to popular belief, Uzbekistan is actually quite liberal. Although most of its population is Muslim, this country isn’t officially a Muslim country and many cultures and religions coexist and are welcome here. Uzbek people consider their homeland to be secular and modern, and there are no strict rules here about how women should dress. We saw schoolgirls wearing short skirts especially in large and modern cities like Tashkent. Headscarves are not required at all, even when entering many mosques. There are some mosques that require you to wear them though, such as Minor Mosque in Tashkent. That is however the only one we personally encountered that has the requirement. 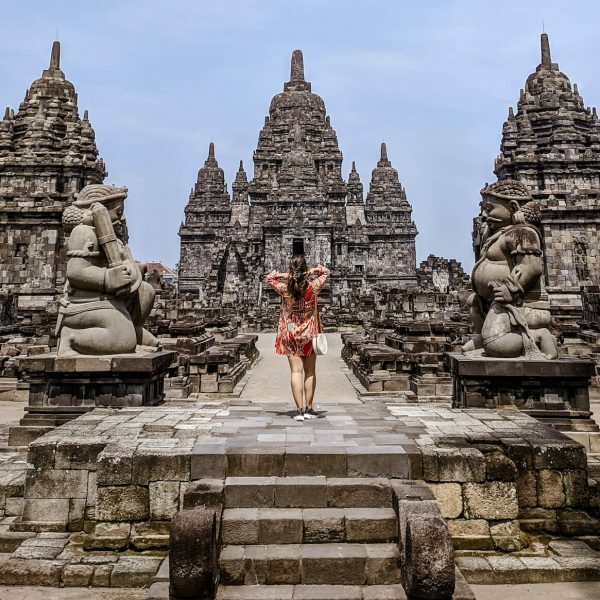 You may get certain looks from the older generation if you’re seen in short dresses and tank tops, but just like in many other secular countries, that is only because of cultural and generational differences rather than religious ones. 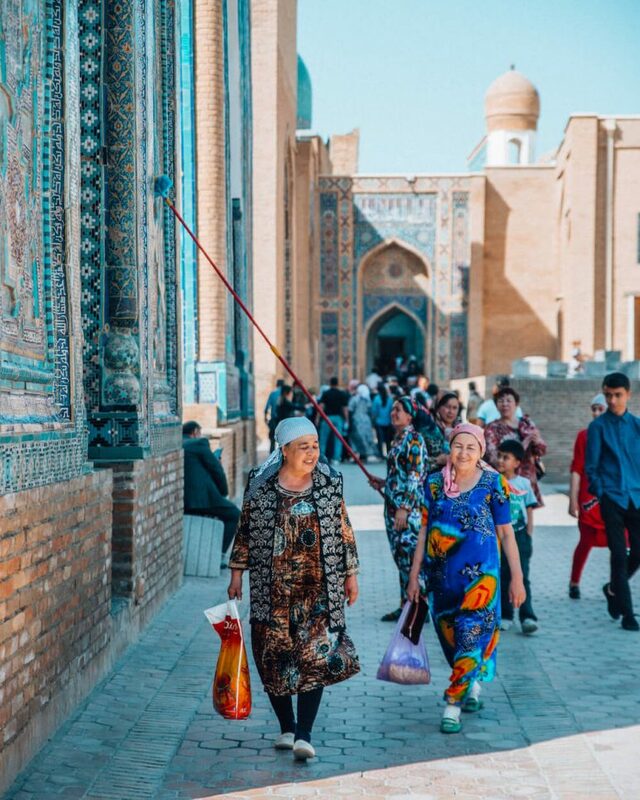 Like many other places in the world, the older generation in Uzbekistan dresses more conservatively while the younger generation is far more liberal. My suggestion is therefore: do what’s most comfortable for you. But do keep in mind that Uzbek people don’t think of their country as Muslim and don’t expect you to dress like you’re in one. All that being said, definitely still bring some clothes that cover your knees and shoulders for mosques and mausoleums. No one will scream at you for not doing so, but it’s the respectful thing to do. Uzbekistan is one of the safest countries you can visit. It boasts a very low crime rate and doesn’t have the safety concerns (such as pickpocketing) that you may find in many European cities. Never once did we feel threatened when we were there, even when walking around at night. We also met a woman who was traveling solo in Uzbekistan, and she shared some of her experiences with us. She said that during her time there, she’s been met with nothing but kindness from the locals, who were there to help her out whenever she needed it. She said that when she first landed at the airport, she couldn’t find taxis anywhere. A local who needed a taxi too saw her struggling and hailed one for both of them. He asked the driver to drop her off at her hotel but insistently refused to let her pay her share, essentially giving her a free ride. 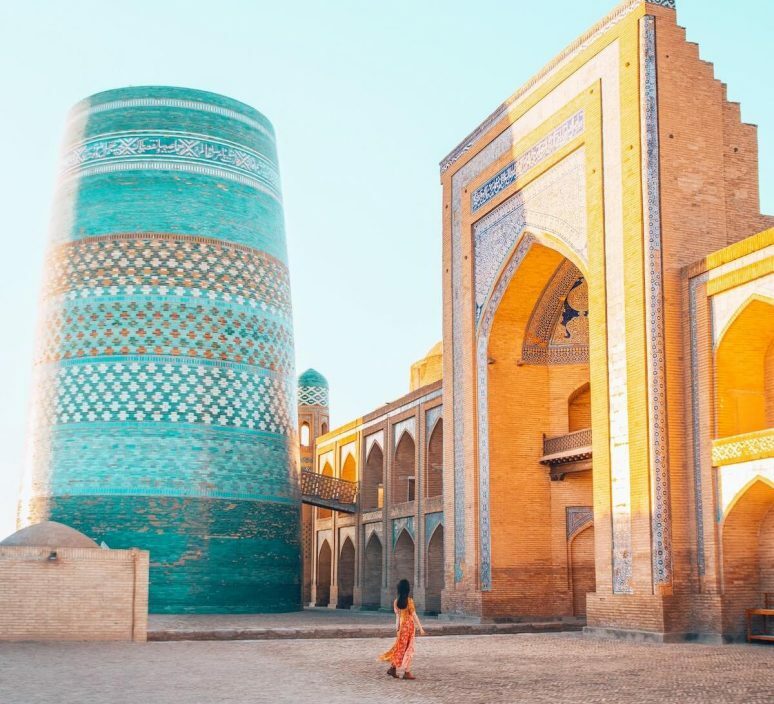 She also shared that one of the locals she met in Uzbekistan spent an entire day giving her a free tour of Samarkand, showing her all the hidden and local spots that she would have never discovered by herself. This was not surprising to hear, as our own encounters with Uzbek people had been nothing short of heartwarming. They are, in general, extremely friendly and welcoming, and often go out of their way to make sure you have the best experience in their country. 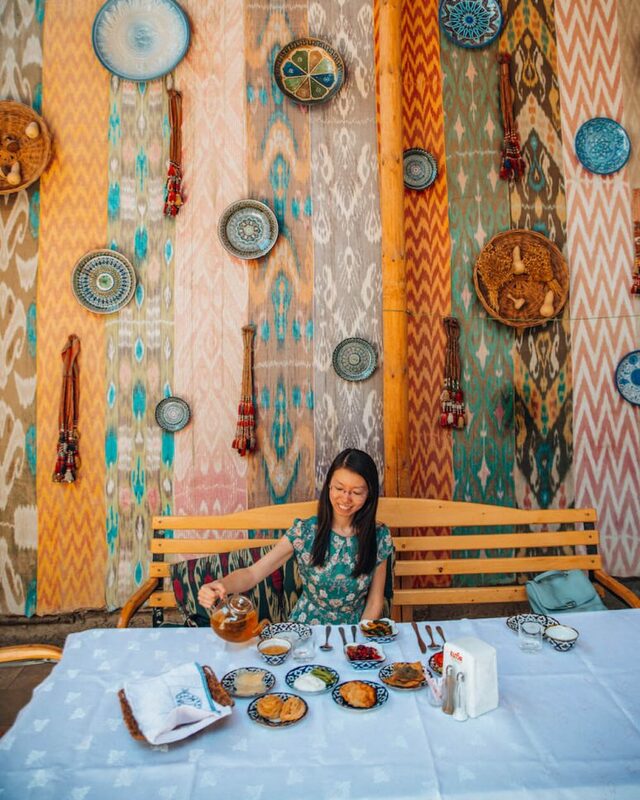 So if you’re thinking about traveling alone in Uzbekistan, just apply common sense like you would anywhere else, and you will have a great time. LANGUAGE – While Uzbek and Russian are the main languages spoken in Uzbekistan, basic English is understood at most tourist attractions. You may have to rely on hand gestures (or Google Translate) in other parts of the city, but we never found the language barrier to be big enough to cause any real issues. BUDGET – This country is very budget friendly. Good hotels & guest houses cost around $20 – $30 a night. A full-course meal with several mains, appetizers and drinks usually totals up to $6 per person (the amount of food would be enough to feed four people though). As I mentioned before, taxis within cities are around $1.25 for a 10-15 minute ride, and fast-speed trains connecting Samarkand, Bukhara and Tashkent cost $7 if you buy them at the station. Your flight is the only thing that may be costly. 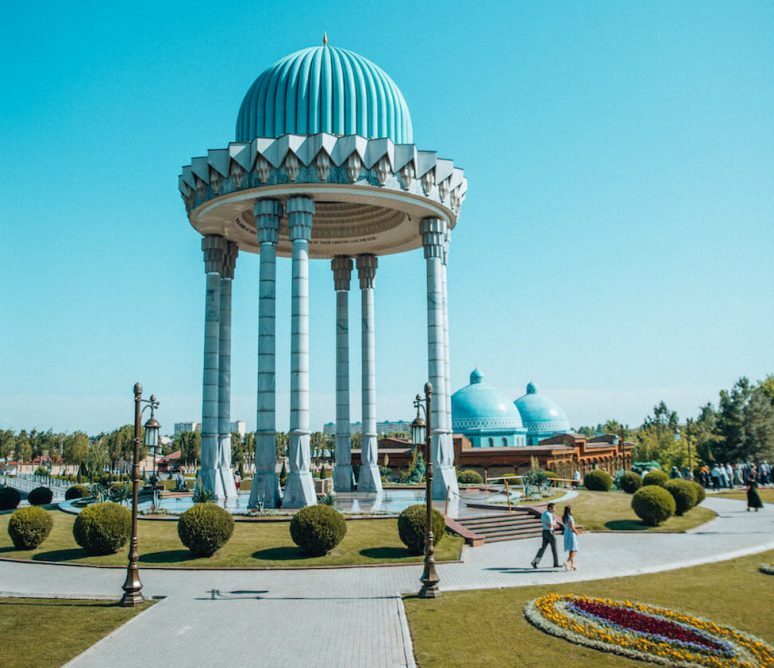 A flight from Europe to Tashkent or Samarkand is usually around $600, and that number will probably be a lot higher if you’re flying from somewhere further away. If that is the case, it may be a good idea to visit Uzbekistan as part of a bigger European or Central Asian trip. CASH – ATMs are everywhere, unlike a few years ago when you had to travel around the country with bags full of cash. Nowadays, you can find ATMs in many hotels and restaurants, and scattered all over the city. WIFI (OR LACK THEREOF) – As I mentioned briefly before, be prepared for very poor WiFi connection in hotels and guest houses. Uploading and downloading small files can take up to an hour, if it works at all. Often times, the connection would fail altogether. Expect some quality time away from technology. TOUR GROUP OR ON YOUR OWN? – As you can see from all the information above, Uzbekistan is incredibly easy to navigate on your own. Going with a tour agency would be a lot more expensive and in my opinion, unnecessary and not worth it. Unless you prioritize having a tour guide who can explain every attraction in each city, I’d highly recommend booking everything yourself as it’s cheap and a piece of cake to do. 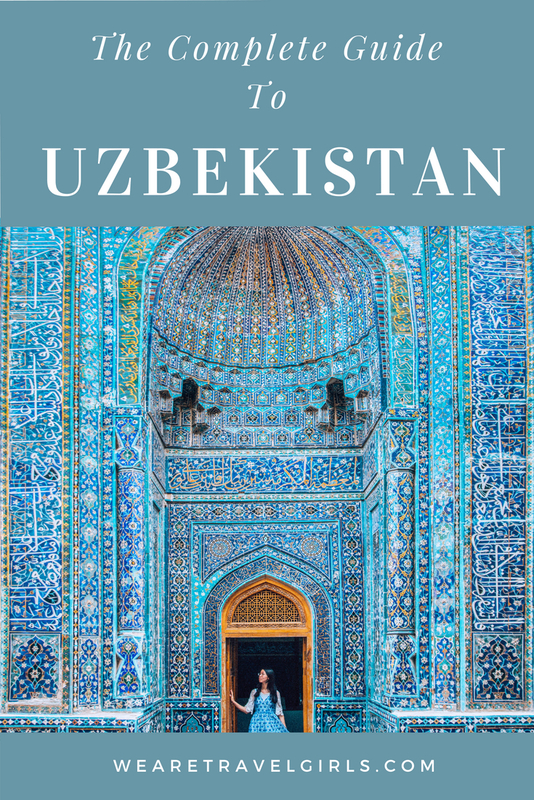 If you’re still debating about whether or not you should visit Uzbekistan, I’ll end this guide by saying that out of the 50+ countries I’ve been to, Uzbekistan is one of the most breathtaking, remarkable, and underrated places I’ve ever experienced. Never in my life have I come across architecture so mesmerizing that it left me speechless every corner I turned; people so friendly that I felt genuinely welcomed into a country so foreign to me; food so delicious that I still dream about it everyday; and beauty so staggering that I still refuse to believe what I saw in this country was real at all. 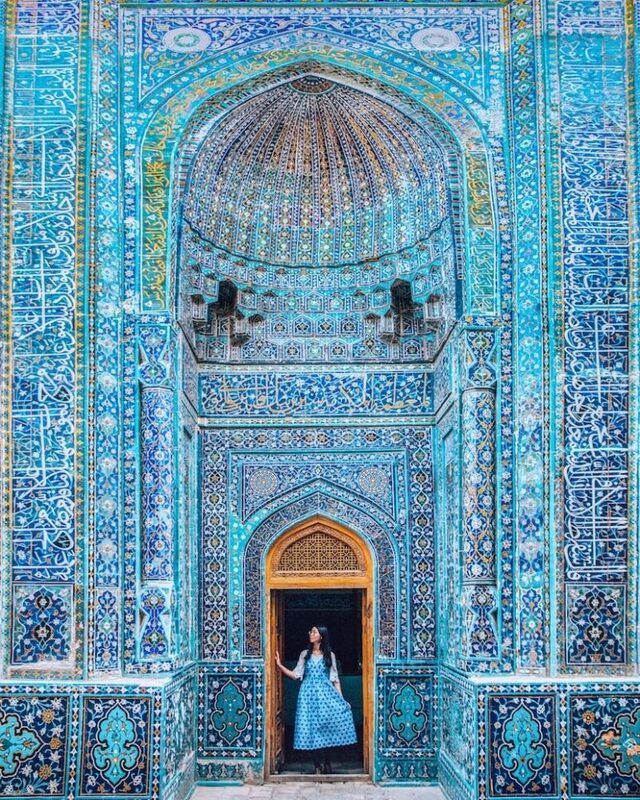 Uzbekistan is an utter dream. 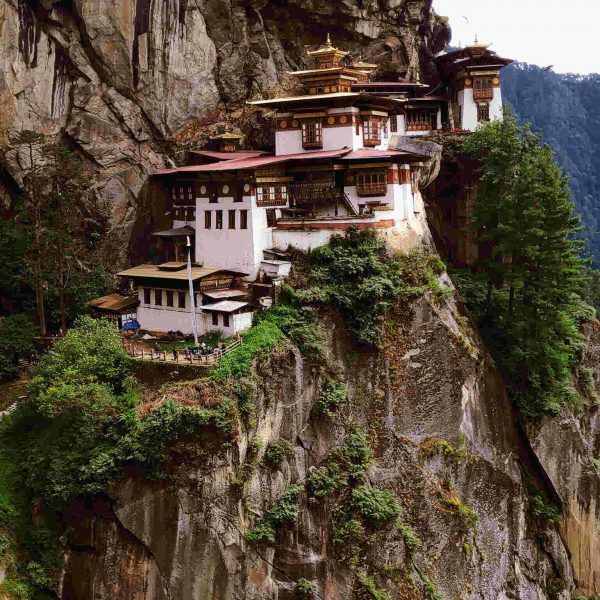 An architecture fiend’s fantasy, a photographer’s heaven, and an intrepid traveler’s ultimate gem to uncover. If you don’t stop by, you’re truly missing out. Have you been to Uzbekistan? If you have any additional tips for our readers or questions please leave these in the comments below. What a comprehensive and beautifully written piece! I’m right now in Uzbekistan and it is wonderfull!! I would recommend it to everyone! Since august this year it is possible to buy traintickets in advance at http://www.railway.uz . You need a visa card to buy the tickets. For some trains you get an e-ticket and for others a form to pick up the tickets at the trainstation. We used both of the options and it worked perfect. Thanks for such a comprehensive guide, Jiayi. 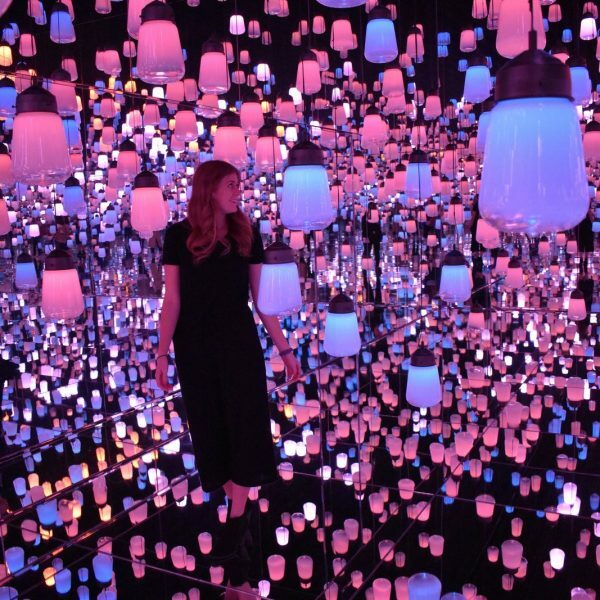 Your gorgeous imagery on Instagram has inspired me to visit next year. Since I always prefer independent travel, it’s great to know how easy it is to get around as well a the affordable pricing. Given that I’m a photographer, I plan to maximize my time in each place so that I can capture images at sunrise and sunset and will definitely plan to visit Khiva as a result of your description. I live in Uzbekistan, although I am not Uzbek. It is a wonderful country. Your guide is pretty accurate. I do need to say that Uzbeks do think of themselves as Muslim and are quite proud of it. However, thanks to the years of Soviet official atheism, it is more of a cultural identity for many. People believe, but not everyone practices fully. Uzbeks are moderate, not liberal. The culture is generally very conservative, even in the cities. I would recommend conservative dress, especially when visiting mosques, madrasahs, bazaars, etc. It should be the same as if you visit churches or cathedrals in Europe. The Uzbeks are too polite to say anything negative to a guest, but they will appreciate the respect. Although your blog is geared to women, it should be noted that shorts are rarely worn by men in public. Young men are starting to wear shorts, but you won’t see anyone out of their 20s wearing them. Young women rarely wear shorts (older, never). Again, no one will say anything, but you will be very conspicuous. Uzbekistan is being discovered. Come! Thanks for your insight and great comment. As a tourist, I think it’s very important to respect the local culture wherever we go. I have been thinking to visit my best friend in Bukhara and this article really helped alot. It contains all the remarkable things one need to mention in a travel guide. It is just perfect. Thank you for sharing such a beautiful story of my home country . I’m so glad to see more and more people discovering this wonderful country which I call home. All your comments, thoughts, images about Uzbekistan is making me miss the motherland . What should be the average budget of a single traveler when visiting Uzbekistan? Wow!!! What a wonderful and comprehensive piece of writing. Thank you so much!! 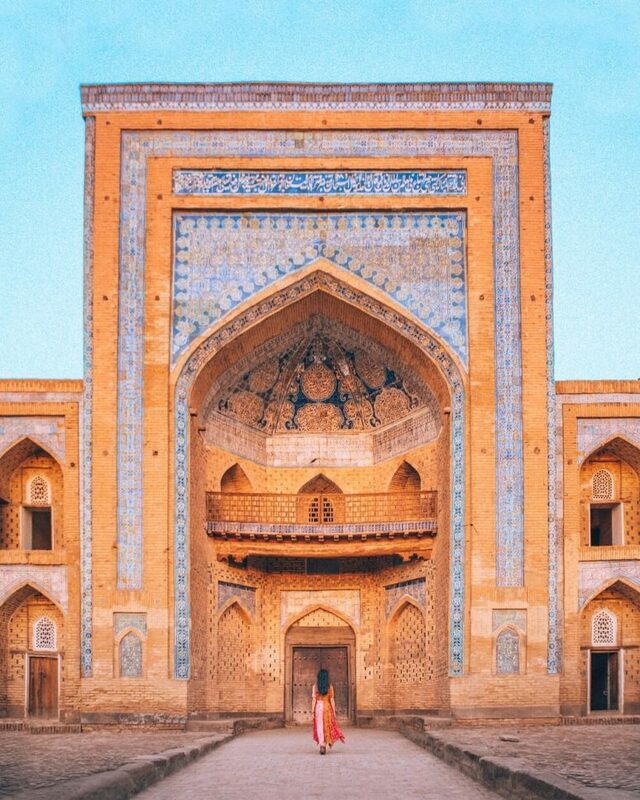 I came here from your amazing Instagram photos, and now Uzbekistan is definitely on top of my bucket list!! Great work!! 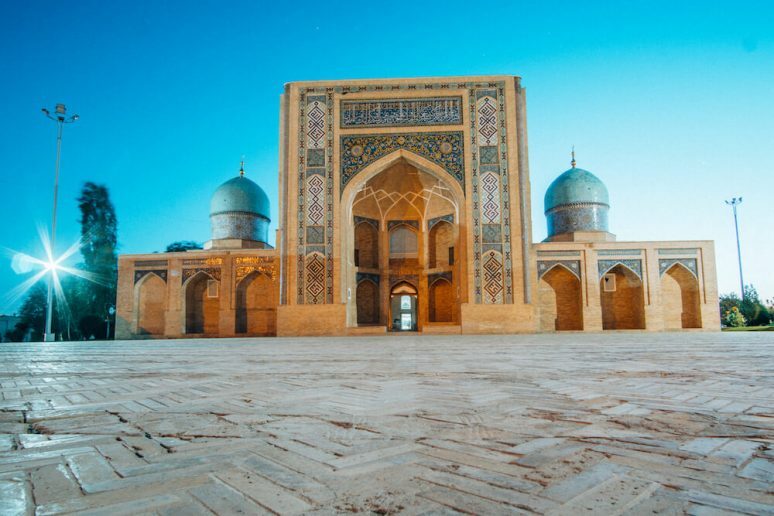 Such an informative article on Uzbekistan, I’m definitely going to be planning to go there soon. I love the architecture and the relaxed vibe.